As you prepare to solidify your travel plans for the year, think beyond destinations that are driven by trends or your Instagram feed. Allow underrated locales to dictate your travels—those that are primed for discovery and exploration and driven by culinary breakthroughs or design-forward ventures. We turned to the fresh crop of hotels opening this year to find out which under-the-radar destinations are set to be big. Scattered across the globe in places near and far, these establishments go above and beyond what one may expect from an ordinary lodging. Aesthetics and a well-curated ambiance are of the utmost importance, closely followed by thoughtful odes to the local culture of the destination itself. The result is an experience riddled with charm and discovery—one you would be hard-pressed to replicate anywhere else. Read on for the most anticipated hotel openings of 2019 and get ready for some serious wanderlust. Nestled on the Indian Ocean, Zuri Zanzibar’s seemingly endless list of draws includes a private beach, its very own spice garden, and a west-facing position prime for panoramic sunset views. Its modern-meets-traditional African-inspired design scheme is easily one of the establishment’s more awe-inspiring elements to date. Designed by Jestico + Whiles, the property comprises a series of bungalows and suites with private terraces built into a garden-esque landscape inspired by traditional African villages. 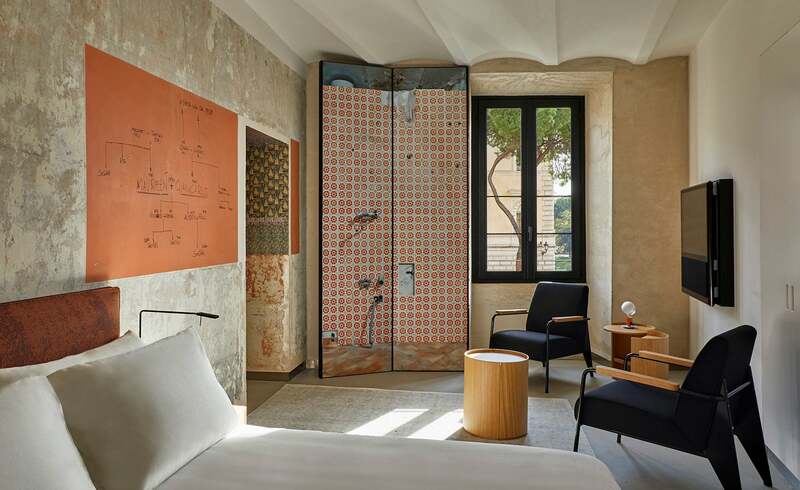 Set to open in April 2019, Maison de la Luz is a luxury guest house established by creative studio Atelier Ace—the design team behind the famed Ace Hotel group. With over 60 available rooms, the hotel’s revered decorative scheme pays homage to New Orleans’s storied past elevated by bespoke elements and French-inspired flair. Old-world elegance and modern conveniences are at the core of the hotel’s identity, playing to the vibrancy of its revered locale in the city’s vibrant Arts Warehouse district. Comprising 24 architecturally rich apartments, The Rooms of Rome blurs the line between a hotel and a cultural phenomenon. Designed by Jean Nouvel, the space challenges all preconceived notions of what a standard lodging experience may entail courtesy of its impeccably designed interior and artful personality. Shinola Hotel is the latest and highly anticipated addition to Detroit’s burgeoning design scene. The product of a collaboration between luxury watchmaker Shinola and real estate firm Bedrock, the hotel brings a bold dose of modern elegance to Motor City with thoughtful odes to its past. The hotel currently occupies five buildings, two of which happen to be restored historic sites, and even boasts a curated retail experience featuring partnerships with brands such as Le Labo and Madewell. The allure of Cabo has not been lost on us. A locale once known for its infamous nightlife scene has, as of late, undergone a transformative rebrand geared toward artists and wellness enthusiasts alike. Opening in April of 2019, the hotel is the brainchild of Robert De Niro and Chef Nobu Matsuhisa and pays tribute to the brand’s signature minimalist style coupled with Mexican-inspired design. Luxury may be at the forefront of the design, but the hotel’s streamlined elegance and architecturally rich details will not go unnoticed. The creatives behind the Ace Hotel group are taking their talents East. The first of the group’s property in Japan, the hotel is set to open later this year and will encompass inspired design with curated elements that pay tribute to the unique local culture and decorative style. This is one to keep your eye on. The fifth location of the Artist Residence brand comes to Bristol in what will be a captivating setting geared toward the art lover with a penchant for design. Set in a former boot factory, the hotel is set to open in March 2019 and will feature an eclectically bold interior featuring the works of various artists. Set to open later this year, following the launch of its sister property in San Francisco, Austin Proper is bringing the group’s signature style to the Southwest. The boutique luxury hotel’s interiors are designed by Kelly Wearstler and features a select number of residences available for purchase. The design philosophy behind Zadun is a simple one: It celebrates the juxtaposition of Cabo’s unique landscape, where the desert meets the sea in effortless harmony. Set against a dramatic coastline, the striking design of the hotel celebrates the inspired terrain with an ode to modern elegance. An iconic fixture of Southeast Asia, Raffles Singapore is the arguable epitome of old-world elegance. Established in 1887, the hotel recently underwent serious renovations and is set to reopen this summer—ideal timing, as tourists flock to the rapidly growing destination.